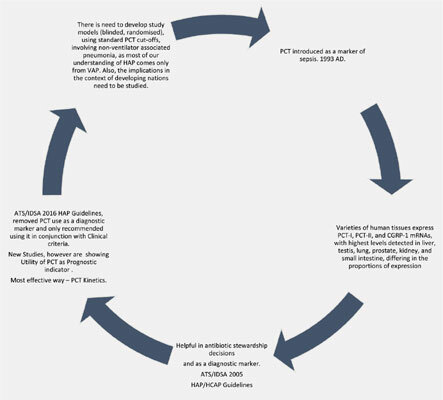 Procalcitonin was introduced to management of hospital-acquired pneumonia/ventilatorassociated pneumonia (HAP/VAP) by the American Thoracic Society/Infectious Disease Society of America (ATS/IDSA), in its 2005 HAP guidelines. It was based on the assumption that positive procalcitonin (PCT) results indicative of HAP/VAP of bacterial aetiology will prompt antibiotic therapy, and improve clinical outcomes. Antibiotic stewardship by monitoring of PCT kinetics resulted in shorter antibiotic treatment durations with early cessation of therapies. The diagnostic part is no more recommended due to weak evidence from studies. Beyond diagnostic uses, some studies have shown that positive PCT levels are associated with poorer clinical outcomes in HAP/VAP, Healthcare-associated pneumonia and community-acquired pneumonia. The article will discuss the diagnostic role briefly and mainly the role as a prognostic indicator in the management of HAP/VAP. Hospital acquired, mortality, pneumonia, procalcitonin, respiratory tract infection, ventilator associated pneumonia.